As we age, our systems produce less collagen. This usually starts in our mid 20s causing our skin to sag, wrinkle and get dryer. Luckily, there are countless ways to reverse or combat aging. One of the most effective ways is to take collagen supplements. I know it's sometimes boring to take capsules or tablets and we most of time tend to forget to take those because they weren't included in our daily routine. 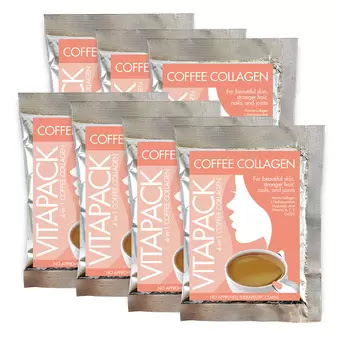 VITAPACK 4-in-1 Coffee Collagen is a Collagen powder in a 3-in-1 coffee drink that helps you get glowing, young-looking skin while you take your daily coffee. • 7000mg of Marine Collagen in a delicious coffee drink with no fishy taste, unlike other collagen drinks. • L-hydroxyproline to stabilize and keep intact the collagen protein structure for long-lasting younger looking skin. • Hyaluronic acid to keep moisture in skin. 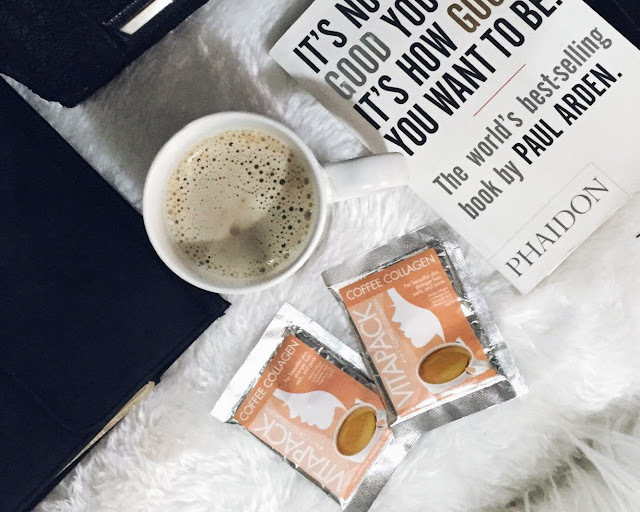 Mix 1 sachet of VitaPack 4 in 1 Coffee Collagen to a cup of hot water. Stir and enjoy. I was once a coffeemaker I mean a coffeeholic hahaha coffeemaker?? 😂😂 However, my doctor advised me to minimize my intake of coffee because of my acid reflux and it also triggers panic attack. Yes, I have panic disorder and I'm fighting it everyday. When I received this VitaPack Collagen Coffee, it makes me sad because as much as I would love to drink this everyday, I'm afraid I can't because of the things mentioned above. A week later, she called me to tell that she's loving the coffee so much because according to her, it smells so good and tastes so yummy. After two weeks, I Skyped her and out of nowhere, she opened the topic about the said coffee. She told me that it makes her feel so young and blooming each day. So I asked her if she observed any side effects like palpitations, heartburn or hyperacidity and she answered no. In fact, it makes her bowel movement better. All in all, I highly recommend VitaPack 4 in 1 Coffee Collagen to you guys. Tho I didn't try it personally, I believe in my moms testimony and I trust her. She's the most frank and honest person I know, I swear! hehe. You don't need to be old to take collagen supplements, you can start in your mid 20s to maintain that evergreen beauty and wellness.